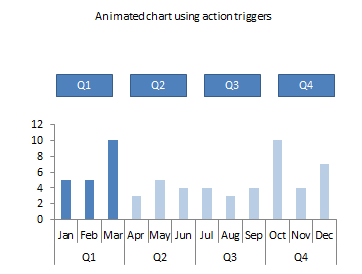 I replied to a post on Chandoo.org by Chirayu on animating a chart in PowerPoint. 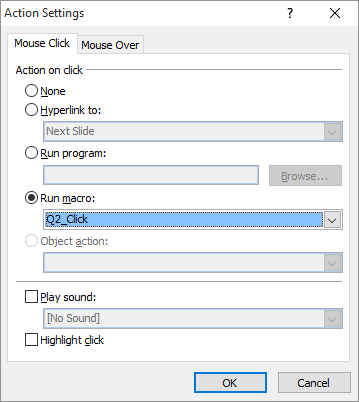 Here is the animation pane showing the effects and triggers which vary which of the chart objects on the slide are shown at any one time. Also as an alternative to the VBA suggestion of altering the stack of images I used VBA to manipulate the chart series. The data within the chart needs to be layout as shown below. This will then create 5 series of columns. The Data series is used to display the out of focus columns for all months. The other 4 series are used to display each quarters data only. 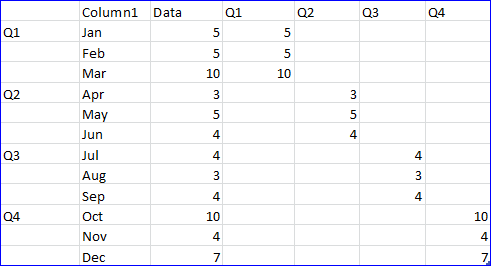 The following VBA code is used to control the transparency of the quarter series. Each of the Quarter shapes can then have a action assigned to them.